Note: It is unfortunately not possible to be awarded more than one scholarship and combinations are not possible. Wittenborg offers students from Russia the chance to study on one of its bachelor's or master's degree programmes through the OTS Scholarship programme. The Bachelor International Business Administration (IBA) in 10 specialised fields offers students with 3 years previous higher education or a Higher National Diploma equivalent in a business-related field to follow a Top-Up Final Year. Please note that all IBA programmes participate in the OTS Scholarship, except for the IBA Entrepreneurship & Small Business, IBA Hospitality Management and the BA (Hons) International Hospitality Management programme. For an overview of all of our IBA Final Year programmes, please have a look here. The Master of Science programmes, also available with OTS Scholarships, are offered jointly with the University of Brighton’s faculty, the School of Service and Sport Management, and successful students are awarded a UK MSc (Master of Science Degree) and a PGDip (Postgraduate Diploma) from Wittenborg. The programme is fully taught in the Netherlands at Wittenborg’s campus in the Netherlands, by a mixture of professors from the University of Brighton and Wittenborg University. Students who study on the Master of International Science programmes in International Hospitality Management, International Tourism Management or International Event Management can make full use of the resources of Wittenborg and the University of Brighton, including online research facilities. If students wish to conduct their Final Project (from April to September) in the UK, this can be arranged. The MBA programmes currently has 8 specialisations and is fully taught in our Apeldoorn campus. Students applying for this programme need to have at least a bachelor’s degree, along with 3 years of professional work experience after obtaining the bachelor’s degree. For an overview of all MSc and MBA programmes that participate in the OTS Scholarship programme, please have a look here. Wittenborg University will provide 2 scholarships of 5,000 euro each for the final year International Business Administration (IBA) programme and 6 scholarships of 7,500 euro each for the MSc and MBA programmes. The scholarships are a reduction of tuition fees for the (1 year) duration of the Bachelor Final Year programmes and the Master's Degree programmes. Work experience: Work experience is not required for enrolment into the MSc programmes. For the MBA programmes, a minimum of 3 years of work experience is a mandatory requirement for enrolment into the MBA programmes. The deadline for applying for the OTS Scholarship is April 1st. 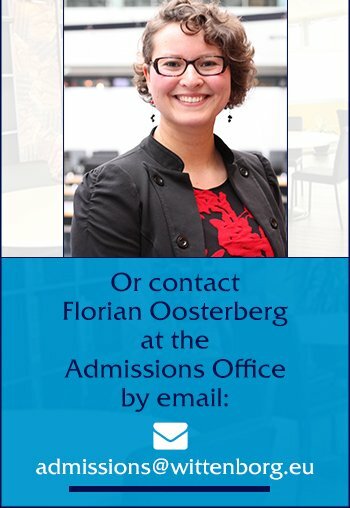 In order to apply for this scholarship, please send your OTS application form along with your Wittenborg application documents to admission@wittenborg.eu. Additionally, please do not forget to inform the NESO office in your country of your application for the OTS scholarship.